Golden Paradigm Review - Golden Paradigm is a Scam! Golden Paradigm Review – Golden Paradigm is a Scam! Golden Paradigm 2016 found at thegoldenparadigm.co touts itself as a software that can generate $978.63 for you hourly. Sounds out of the world? Indeed, because Golden Paradigm is a scam. Read our in-depth Golden Paradigm review before you set yourself up for a huge disappointment! Did you notice something was off as soon as you enter the sales page of Golden Paradigm scam? Instead of cutting straight into the introduction, Golden Paradigm used some pretty nifty marketing techniques to get you hooked. When you first enter the website, you notice the headline above the sales video. It says PRIVATE INVITE, but in fact it’s just there to give you a sense of exclusivity and keep you interested. Anyone with the link can view the sales video and become a victim of scam. 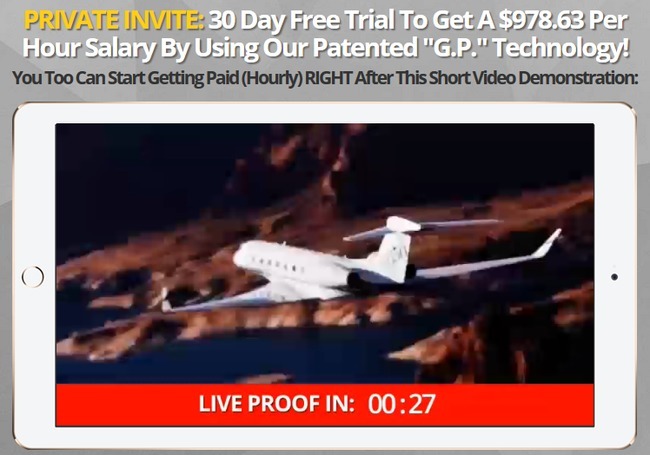 Next, Golden Paradigm scam puts up a very attractive promise – getting paid $978.63 hourly using their “patented” technology. Is it telling the truth? Unfortunately not. The headline is there to entice you into watching the full sales video, and it’s in the video where the scammers behind Golden Paradigm try to brainwash you. The video starts with clips of sports car, luxurious vacations, private jet, and dream mansions. It’s implying that you can own all of those if you sign up for their scam, which is a tactic widely used in online scams to trap unsuspecting internet users. The rest of the sales video is narrated by Nathan Weiss, the alleged owner of Golden Paradigm who keeps promising great wealth if you use his “secret system”, but we’ve found strong evidences to prove that Golden Paradigm is a scam. Below the sales video, you’ll see this sign up box where you are required to key in your email address and opt in for Golden Paradigm. Above the box, you’ll see a countdown timer that starts counting down from 15:00 minutes, as soon as you enter the sales page. It’s said that if you don’t sign up within the stipulated time, your “spot” will be taken by the next invitee. The important question is – are there really limited spots to Golden Paradigm? How do we know if the countdown timer is real? One easy way is to find out is to reload the page, and you’ll realize that the timer resets itself, too. It’s just a computer script that is set to countdown every time the webpage is loaded. Similar trick was used in other binary trading software scam such as Amissio Formula and Zulander Hack. By adding the countdown timer, Golden Paradigm scam will be able to force a few more impulse sign ups and make money off these victims. Actually, did you realize that you don’t need to key in your email at all to get into their “members-only” page? You just have to go to this link thegoldenparadigm.co/members and you’re in! The whole “reserve your spot with email address” is just a heist to obtain your information, so they can send you more shady emails and hopefully, sign you up with some of them. Golden Paradigm scam decides to sum up all the “perks” of the software in their second sales page, as displayed above. EVERY SINGLE ONE of these promises are fake, and we’ll expose it right away. Even though Nathan Weiss repeatedly promised that his software is guaranteed to make huge profits for you, he has something entirely different to say in Golden Paradigm disclaimer. You can’t find this document anywhere in the sales materials, except for the very bottom of their sales page. It’s linked through an extremely small fine print that reads “disclaimer”. You can verify the authenticity of the quoted terms here: thegoldenparadigm.co/disclaimer. I’ve underlined the important terms in red, but let me interpret them here. Due to the high risk nature of trading, ‘The Golden Paradigm” explicitly does not make any express or implied warranties or guarantees that user will make any profit or that user will not lose any or all deposited investment funds. Self explanatory – Contrary to what they promise in the sales materials, Golden Paradigm scam does not guarantee you any profit. Not only that, you will most likely end up losing ALL your deposited investment funds. Again, Golden Paradigm scam admits that trading binary options is extremely risky, and it is only for investors who can stomach the loss of their entire investments. It’s very obvious that the scammers behind Golden Paradigm scam are trying to escape from the blatant lies and fake promises they have given you in the sales materials. Compare their disclaimer and what they claimed in the sales material, and you can detect the differences. This document is not here to give you a fair warning as a consumer. The sole purpose is to protect those scammers from legal issues when the software doesn’t live up to its promises and make you lose all your money. Is Golden Paradigm a Scam? YES, GOLDEN PARADIGM IS A SCAM. We strongly advise you to stay away from the scam if you don’t want to lose your hard-earned money. Drexel Code Review – Drexel Code is a Scam! Safe Income Scam Review – Not Safe at All!